March 31, 2016, 9:23 a.m. Since the beginning of the 19th century, God Save the King (or Queen!) came to be known as the UK’s national anthem. Unlike the other three countries that make up the nation, England has, perhaps curiously, no official anthem of its own, instead adopting the hymn used for the whole in somewhat of a fait accompli as its unofficial national anthem. However, a campaign for England to have its own, official anthem has gained traction recently. YouGov wanted to see whether its Opinion Formers – which draws leaders from the worlds of business, politics, the media, charities, public sector and academia among others – even wanted a new anthem for England. 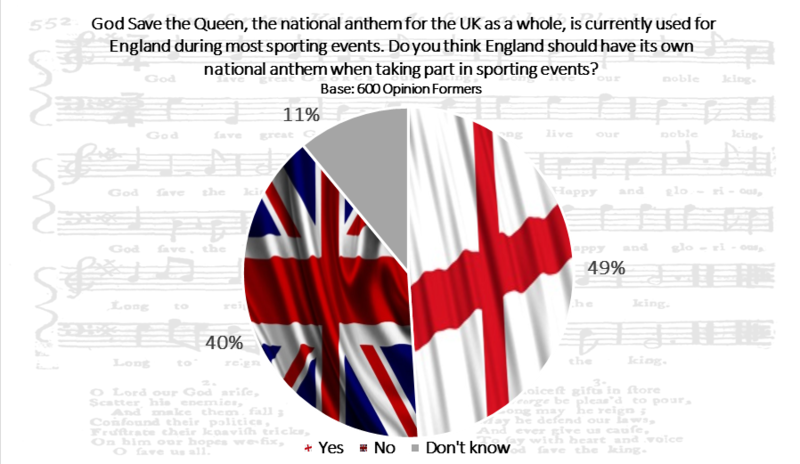 Nearly half (49%) think that England should have its own National Anthem at sporting events, with 40% against the idea and 11% unsure. 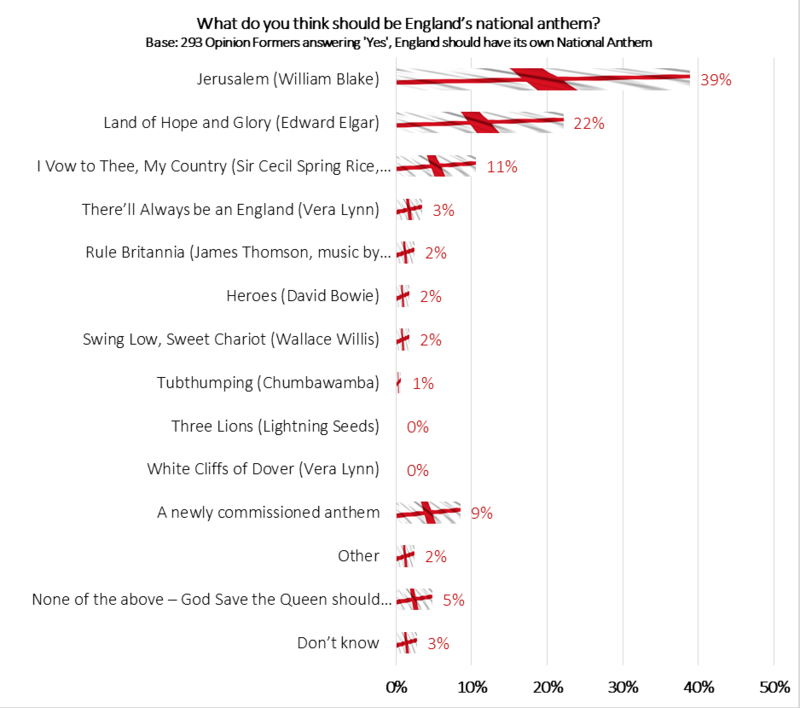 When those agreeing that there should be an anthem specific to England for sporting events were asked what they think the new anthem should be, ‘Jerusalem’ by William Blake (39%) and ‘Land of Hope and Glory’ by Edward Elgar (22%) came out on top, with ‘I Vow to Thee, My Country’ by Sir Cecil Spring Rice (with music by Gustav Holst) emerging third. Even though there clearly seems to be support for a new anthem for England, ‘new’ songs do not seem to be a popular option. If God Save the King/Queen were to be replaced, Opinion Formers appear more favourable toward classical greats. More modern tunes from the 20th Century such as ‘Swing Low, Sweet Chariot’ (adopted by the nation’s Rugby team) and the Lightning Seeds’ ‘Three Lions’, sung on the terraces during the inevitable penalty shootout heartbreak at international football tournaments, received fewer votes. Interestingly however, 9% of Opinion Formers who support the idea of an English national anthem eschewed the idea of picking any existing songs regardless of the era they were from, favouring instead to commission an entirely new anthem. With the Scots’ and the Welsh’s respective identities encapsulated within their own unique national anthems then, perhaps God Save the Queen has finally had its swansong. 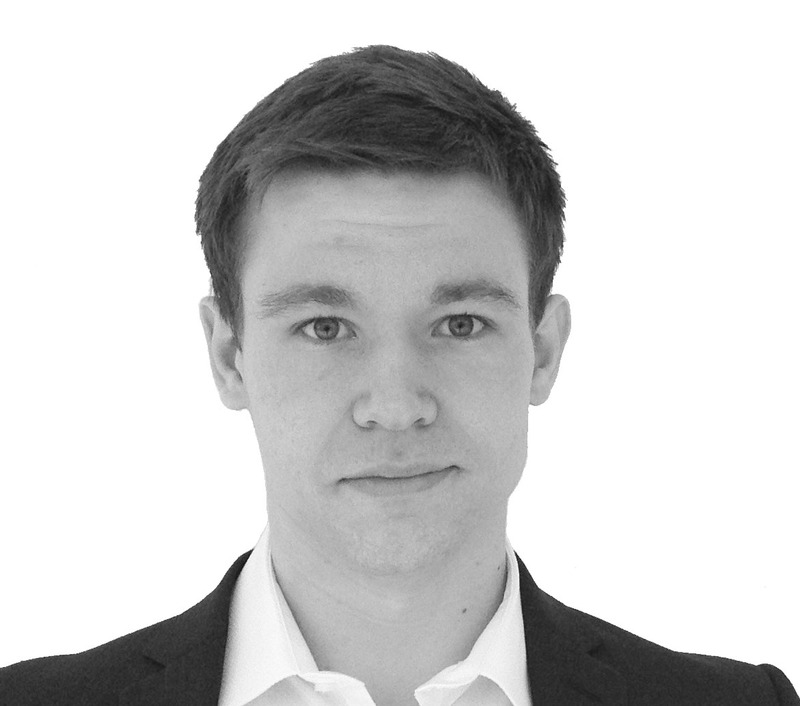 YouGov completed online interviews with 600 opinion formers from its UK Opinion Formers Panel. Opinion Formers are leaders in their field from business, media, politics, NGOs, academia and beyond. Fieldwork was undertaken between 22nd January and 4th February 2016. The figures have not been weighted.